Photo by LORETTA JACKSON The iRobot STEM-MVP Teacher of the Year award winner Frank Xydias, center, an educator at Milford High School’s Applied Technology Center, shares a look at his prize, a Roomba Create 2 programmable robot, admired here by some members of his robotics teams, students, from left, Anamika Usman; Christian Liamos; Matthew Hannon; Nathan Lavine; Tyler Berry; Jack Vogel; Stephen Podd and Kaleigh Wilson, avid investigators of science, technology, engineering and math, fields that offer entry into careers with lofty pay scales. 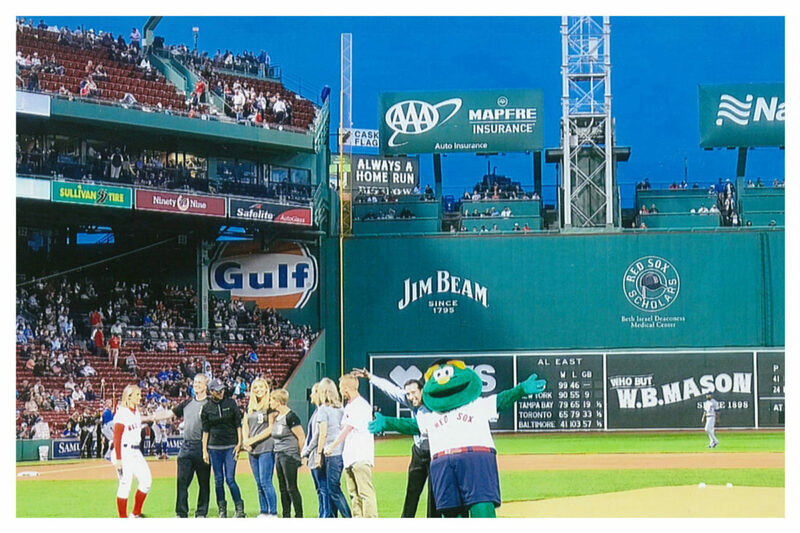 Photo courtesy iRobot Frank Xydias, second from right, a longtime instructor at the Applied Technology Center within Milford High School, shares some fun with Wally the Green Monster – Boston Red Sox mascot – and fellow participants in a recent Fenway Park ceremony that honored Xydias with the high-school division iRobot STEM-MVP Teacher of the Year award, a statewide recognition of teaching excellence whose contenders were nominees from all parts of New Hampshire. Photo courtesy iRobot The announcement that Frank Xydias, a veteran instructor at Milford High School’s Applied Technology Center, has clinched in the high-school division the iRobot STEM-MVP Teacher of the Year award in a statewide competition, is heralded from the Jumbotron video screen at Boston’s Fenway Park during a ceremony conducted at a recent game that pitted the Red Sox against the Toronto Blue Jays and elicited cheers for Xydias and winners in other categories from 35,178 fans who witnessed the award ceremony and the Sox win of 1-0 over the Jays. Fenway Park, home of the Boston Red Sox, was packed with 35,178 fans who saw the Sox spank the Toronto Blue Jays, 1-0, on Sept. 12. They saw the team reach 100 wins at the game for the first time since Ted Williams returned from WWII in 1946. The hoopla was loud. Vigorous too were the cheers for Frank Xydias, of Milford, a high school teacher for more than two decades, who was recognized at the game with the iRobot STEM-MVP Teacher of the Year award. The accolade came from iRobot Corporation, a Boston-based advanced technology firm founded in 1990 by Massachusetts Institute of Technology roboticists. The visionaries focused on designing robots useful for many practical purposes. The STEM-MVP award is given to an extraordinary New Hampshire teacher, a professional selected annually by iRobot during a statewide contest. Xydias won in the high-school division. The veteran educator at the Applied Technology Center within Milford High School, was seen smiling on a video screen nearly 40-feet high and 100-feet wide. A nationwide audience of around 9.3 million television viewers, as reported by Major League Baseball – mlb.com, – saw the ceremony on the park’s Jumbotron. Xydias, nicknamed “Mr. X,” is reputed to be at ease in expressing principles of STEM – science, technology, engineering and math – in an easygoing manner. His aficionados are high schoolers intent on becoming scions of high tech, gurus of nuclear medicine, tomorrow’s physicists or other vital citizens. 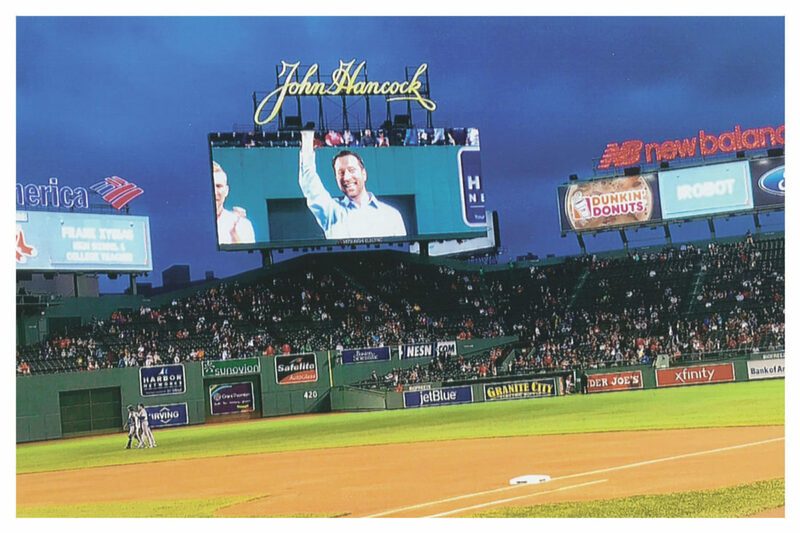 Former student Jennifer Carson, now enrolled in the Mechanical Engineering Department of the University of Rochester, nominated Xydias in a letter to iRobot, whose affiliation with the Boston Red Sox is ongoing through events including STEM career fairs and other activities. Carson said it was his influence that led her to select mechanical engineering as her major at the university. Carson contends that Xydias has bolstered the dreams of “countless” students. He founded Girls in STEM at the high school. The now-coed group draws up to 300 students each year. He also helped Carson create a STEM program for girls in grades 5-8. Xydias also hosts a robotics club comprised of Team Spartan and Team Sparti. Many members are masters at programming intricate gizmos and gadgets that move, lift, throw and manipulate tools, among other tasks. The newest iRobot STEM-MVP Teacher of the Year was gifted at the ballpark with a costly prize, a Roomba Create 2 programmable robot. The unit is highfalutin’ kin to the popular disc-shaped Roomba vacuum sweeper whose sensors guide it around furniture and other obstacles that tend to impede a good cleanup. Xydias took his prize to his classes of around 120 students per year at Milford High School’s Applied Technology Center. There, he encouraged the robotics team to autopsy the unit. They studied its computerized innards and promptly infused some customized programming.